Ever been out to dinner and marvel with a gasp at the succulent beauty of your meal as the waiter places it in front of you? Ever gasped the same way but with a decidedly different feeling when the waiter rests the bill on the table at the end of the meal? Wouldn't it be nice if you could breath a sigh of relief instead? That's the brilliantly simplistic message of this ad for the Salem, MA-based Sixty2 on Wharf Restaurant and Lounge created by Keith Lane Creative. 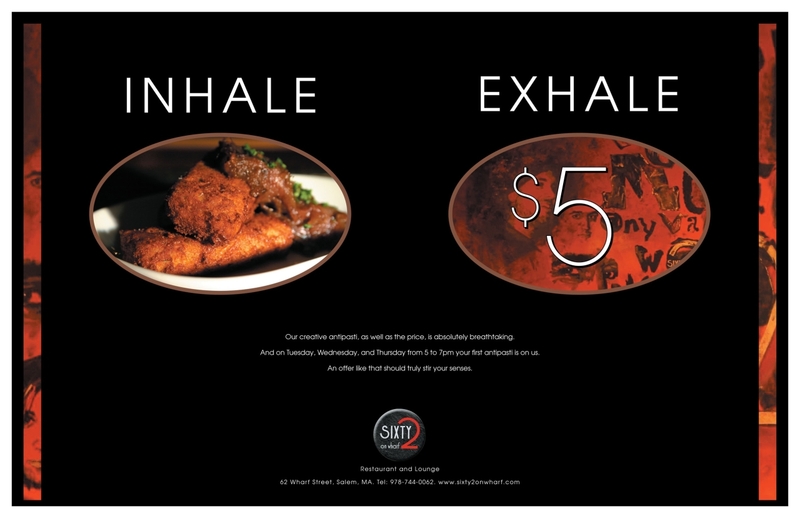 It's part of a campaign to promote the restaurant's mid-week Really Happy Hours from 5PM to 7PM.